Another family birthday, another opportunity for me to speedily create a card with my trusty Pilot Parallel Pens. I get asked a lot about these quick, 15 minute creations, further examples of which you can find here and here. These previous posts have attracted many views, so I thought I’d share my process with anyone who would like to create a quick card of their own. Please note, Pilot Parallel Pens are not essential if you want to give this a try – any large-nibbed pen will suffice – but the Parallel Pens will definitely enhance the effect with their subtle colour transition. Since this process is quick and loose, don’t expect perfection. I’m not happy with all of the lettering in the finished card above (in particular, the extended stroke of the ‘y’ in ‘birthday’ makes me cringe a little)… but hey ho… warts and all is the price we pay for spontaneity! STEP 1: Fold an A4 sheet of card in half (it will later fit into a regular sized C5 envelope for addressing). 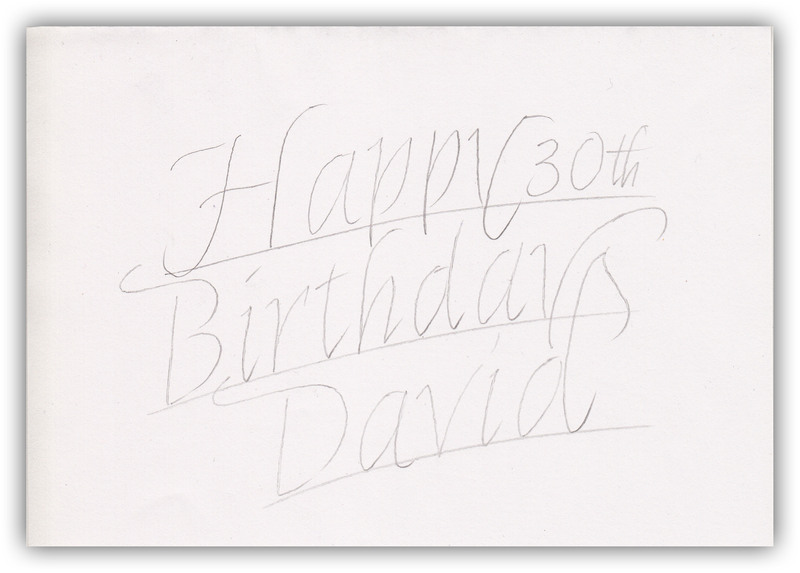 Quickly score three light, evenly-spaced pencil lines across the card, as in fig 1 below. It’s not necessary to measure the position of these lines… just keep a light touch as you sweep the pencil across the surface. STEP 2: Roughly pencil in your chosen message, as in fig 2 below, using the lines as a baseline for your lettering. If you feel you need an x-height, then pencil an additional three lines parallel to the original three. But I find it liberating to work with a baseline only, allowing the letters to slightly vary in height. While you write the text, be aware of any possible pitfalls where ascenders and descenders might clash. You may have to erase and rewrite some text in order to find a solution to this problem. Tighter or looser letter spacing can help, or you can simply shorten the ascenders and descenders. If all else fails, try manipulating the ascenders and descenders to connect with or cut through each other. If you choose the third option, remember to maintain legibility and aesthetic quality as you manipulate the strokes. STEP 3: Trace the pencil lines with your pen of choice, as in fig 3 below, correcting the spacing as you go. 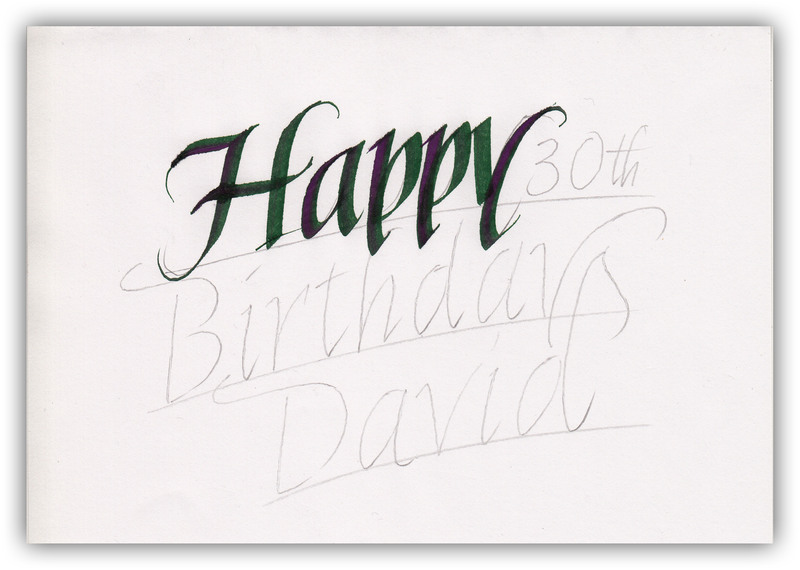 For my completed birthday card at the top (and bottom) of this post, I lettered the text using a 6.0mm Pilot Parallel Pen loaded with green ink. After each pen stroke I transferred a little purple ink from another Pilot Parallel Pen (any size) by briefly touching the two nibs together. The longer the nibs touch, the more ink is transferred, so it’s better to transfer a little ink at a time so that the colour transition within the writing remains regular. If using this technique, please note that mixing two very dark ink colours doesn’t produce attractive lettering. STEP 4: When you have completed all the lettering, use a simple silver or gold monoline gel pen to decorate the letters, as in fig 4 below. I started off by creating small circles of gold ink on the vertical centre of each pen stroke. I then drew gold lines along the very centre of every pen stroke to complete the effect. It isn’t obvious in the example shown below, but these metallic lines really catch the light on the actual card. STEP 5: I then carefully erased all the pencil lines, and used the gel pen to draw a simple gold monoline border along the edge of the card to finish it off, as in fig 5 below. And that’s really all there is to it. Make sure you have all your equipment and materials to hand before you begin, and after a few attempts you’ll be creating attractive greeting cards in minutes. 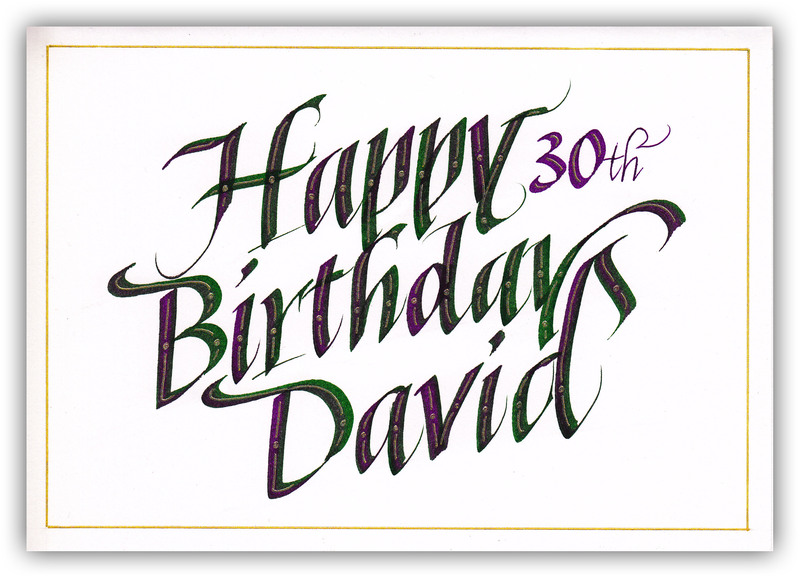 And if, like me, you never remember birthdays until the last minute (or, also like me, you’re reluctant to pay the exorbitant price of shop-bought cards), then the above hand-lettered cards can be life savers… with the added bonus of being a joy to create. When I designed the above card, I discarded steps 2 and 3, preferring to write the final text directly onto the baselines without the convenience of pencilled writing. This is not for everyone, but does save a few minutes of preparation. And I confess that I initially had a very big empty space after “Happy,” which wouldn’t have happened if I’d had the patience to follow steps 2 and 3. The late addition of “30th” to balance the design was an afterthought, but I’m happy with how it all worked out. Even in calligraphy, necessity can be the mother of invention. If anyone has difficulty following the above steps, or has any questions about the process, please leave a comment and I’ll reply straight away. In the meantime, I wish you good luck with your “instant” calligraphic card-making! IF YOU HAVE SOMETHING TO ADD, PLEASE SHARE IN THE COMMENTS BELOW. It was my wife’s birthday on Sunday. I’m ashamed to admit that it kind of snuck up on me. I wasn’t totally unprepared… I had bought her a gift. Well, to be more specific, I had ordered her a gift. The reason I didn’t actually have it is because Amazon lied to me about its likely delivery date. So the only thing that stood between me and empty-handedness was a birthday card. Which I also didn’t have, although I can’t blame Amazon for that. So, at the crack of dawn on Sunday morning, I considered driving to a local 24 hour supermarket to purchase a card. That would have been quick and easy. It would also have been folly on my part. Because, on their birthdays, my family won’t accept a shop-bought card from me. With my calligraphy skills on tap, they expect the real deal. They expect ink and effort and nibs-a-scratching and creativity and uniqueness and personalisation. And you can’t buy that kind of devotion in Tesco. So, while the Birthday Girl slept, I pulled out my Pilot Parallel Pens and got to work. Using a simple process similar to the one I used when addressing my Sherlock Holmes envelope, and creating my son’s birthday card, I made a card for her in less than fifteen minutes (see image above). She was so delighted with the card that she didn’t appear to notice the absence of a gift. So, with the Amazon returns policy in mind, I decided not to mention her oversight. Happy Birthday, Liz. Next year, I promise to be better organised! In my everyday role as a “serious” calligrapher, when addressing envelopes for weddings and corporate events I use regular dip nibs and waterproof ink to achieve a restrained, classic look. 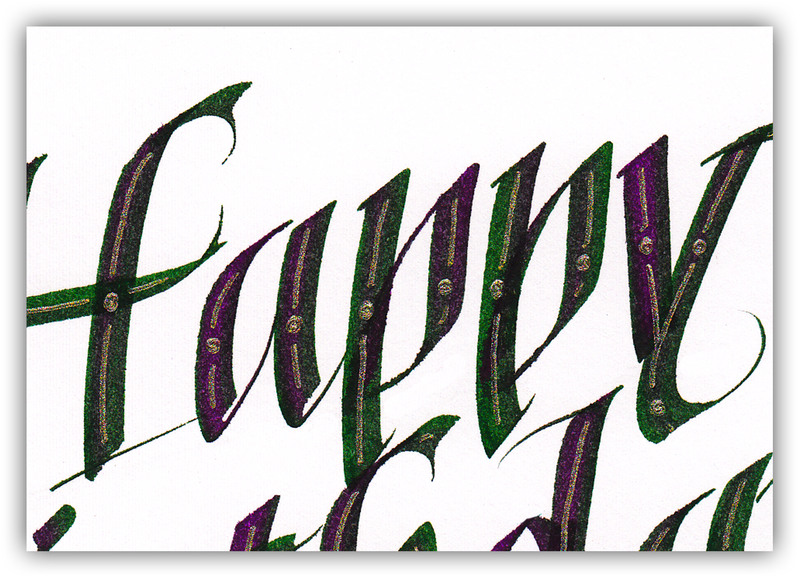 But occasionally, when I’m “off-duty,” I pull out my Pilot Parallel Pens, simply to put some fun back into my envelope-addressing and birthday card creating (see here and here). I recently sent my daughter a letter, and used my Parallel Pens to address the envelope in a fun way. She liked the effect so much that I decided to address another envelope, creating the same effect with the same pens, to feature here (see main image above). It’s quite simple to achieve this effect, and a great opportunity to use your calligraphy skills to brighten up your intended recipient’s day. Who wouldn’t want to receive an envelope that looked like this? I started off by pencilling a slightly curved line across the envelope from left to right (a quick movement… nothing too precise) to act as the baseline for the large lettering. 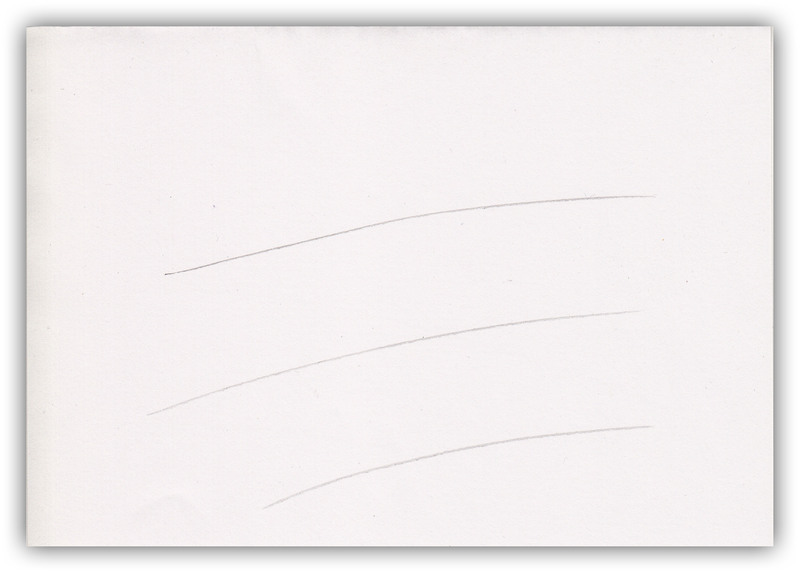 Keep the pencilled line quite low on the envelope, starting about three-quarters way down on the left. If preferred, a parallel pencil line can be drawn above to create an x-height. I used my 6.00mm Parallel Pen, loaded with green ink, to speedily write the words “Sherlock Holmes.” But before starting to write, and at frequent intervals while writing, I transferred red ink from my 3.8mm pen into the 6.00mm pen by touching the two nibs together. Hold the pen that you intend to write with upside down, and feed ink into its nib from above. The longer the nibs touch, the more ink will be transferred, and so the gradation between colours will be longer. Although I used red and green inks together, Pilot offer a pack of “Mixable Colour cartridges” which includes 12 assorted colours. Some produce amazing gradated effects when mixed… others produce the colour of mud! It’s really down to trial and error, so experiment with different colours. If you load four Parallel Pens with four different coloured cartridges, you can mix them in various permutations to produce extreme gradated effects. Another brilliant function of a Parallel Pen is that by tipping the nib onto its corner, a monoline can be produced, which is excellent for handwriting, drawing, or for producing extended hairlines in calligraphic lettering (all the hairlines in “Sherlock Holmes” above were created spontaneously, and on the fly. 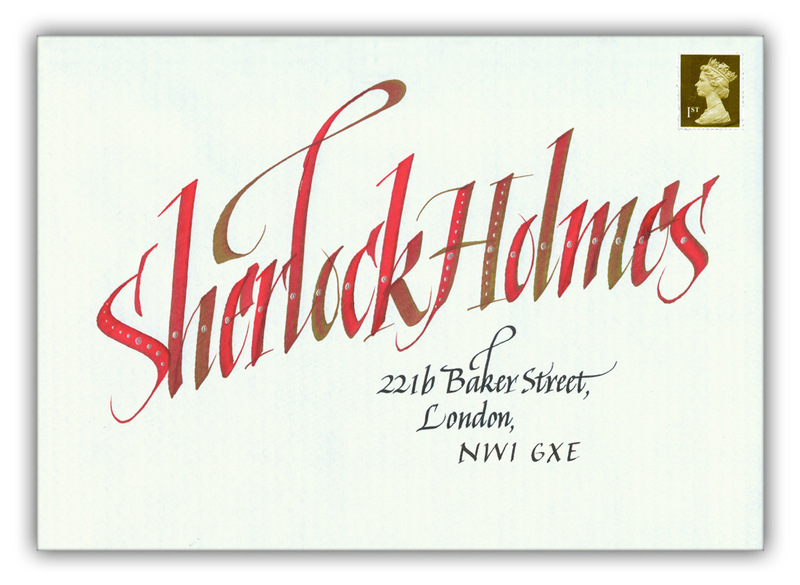 After lettering “Sherlock Holmes” in a compressed Italic to fit the envelope’s width, I simply dotted each letter using a silver monoline gel pen to add some highlights. I lettered the remainder of the address in Italics using a Manuscript broad nib to provide contrast in lettering size. I wrote with black ink so as not to dilute the colourful effect of the top line, or lessen its effect as a focal point. For consistency, and to tie the two elements of the composition together, I looped the “k” in the small lettering to echo the loop in the large “l” above. Why did I choose to address the envelope to “Sherlock Holmes,” you might ask. Well, while googling for an appropriate generic address to write, I discovered that 221b Baker Street, London, is the (allegedly) most famous address in the world, surpassing even 10 Downing Street and the White House in popularity. That’s the rather uninspiring reason for my choosing that particular address. More interesting is the fact that although the address of The Sherlock Holmes Museum is 221b Baker Street, London, the building is actually located between 237 and 241 Baker Street. So, now you know! 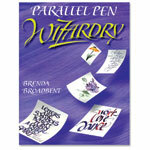 If you already own a set of Parallel Pens, or intend to treat yourself to a set, you should definitely consider purchasing the book “Parallel Pen Wizardry,” by Brenda Broadbent, which is devoted exclusively to the pens. If you can track a copy down, that is. For some reason the book is not widely available in the UK, although it can be purchased from stockists in the US. At time of writing John Neal Bookseller in US has available copies here, although international postage may be costly. The book consists of just 25 pages, but contains a lot of useful information & examples, and is a good companion to the pens. It’s much easier to find the actual pens, which can be purchased at most High Street art stores for around £12.00 each. With four different sizes of pen available (1.5, 2.4, 3.8, and 6.00mm) the full set works out quite expensive if purchased individually. 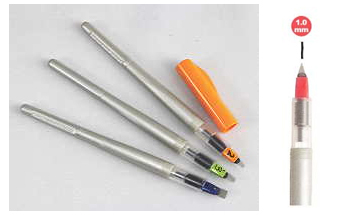 A more economical way is to purchase a set of the three smallest sized pens Pilot Parallel Pen Set of 3 at Amazon for just £19.95 + £1.99 p&p (at time of writing), then purchase the 6.00mm pen separately, if required. One final note of warning. My first experience of Parallel Pens was very negative, as the ink bled and feathered to an extreme level. I gradually discovered that this was due, not to the Pilot cartridges or pens, but to the type of paper I was using. In my experience, Pilot Parallel pens are very particular about the type of medium onto which they will write sharply. Experiment with different papers. I have found that Navigator printer/copier paper works well for general practicing, and is not too expensive. If you haven’t already done so, treat yourself to some Pilot Parallel Pens, and see how they put “FUN” back into your calligraphy. And if you have any opinions about Pilot Parallel Pens (or addressing envelopes, or anything remotely calligraphic), I’d love you to leave a comment. New nib sizes… 2.00mm, 3.00mm, 4.5mm and a hand-cut 1.00mm. Tonight, a day after writing the above post, I discovered (purely by accident) some new additions to the Pilot Parallel Pen range. An online store called “Paper & Ink Arts” is offering a set of three Parallel Pens with nib sizes 2.00mm, 3.00mm and 4.5mm for $40.50 (American dollars). Remarkably, they are also offering an additional Parallel Pen with a hand-cut 1.00mm nib, for small lettering, which retails at $14.95 (American dollars). Unfortunately, every single page on the “Paper & Ink Arts” online store has an identical URL, so it’s not possible to direct you straight to the relevant page. But you can access their website here, then type “Parallel Pens” into the search engine on the home page. On the resulting page, click “Parallel Pens.” On the next page, scroll down until you see the new nib sizes. At present there doesn’t appear to be any UK stockists of these new nib sizes. But if, like me, you’re tempted to be the first kid on the block to own the new pens, it may be worth paying the international postage and waiting a week or two for them to arrive from the States. I’m sure they’ll be worth it (and just think of the kudos)! Update: Thanks to Sergii, who commented that the 1.5, 2.4, 3.8, and 6.00mm pens are available for £8.99 each (at time of writing), including UK p&p at The Writing Desk.